University of South Carolina historian Walter Edgar will open The Historical Society’s 2012 conference Thursday, May 31, on the USC campus. 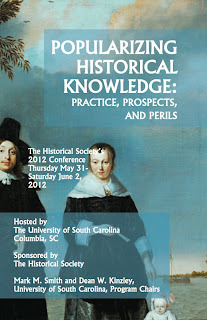 This past weekend I was in Columbia, South Carolina for the biennial conference of The Historical Society. The focus of this year's conference was "Popularizing Historical Knowledge: Practice, Prospects, and Perils." It was hosted by the University of South Carolina.